I know people keep saying this, but the saying is so true.."WHERE HAS SUMMER GONE?!?!" It's already August and it feels like time is flying by super fast. With another month passing us by comes another favorites! Here's a look at what I've been loving last month. 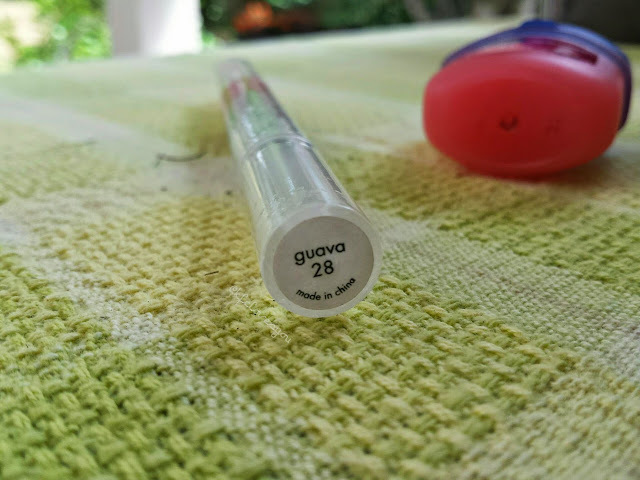 First up are my go-to lip products of July. I still love my bright and bold lipsticks, but I found myself gravitating towards these two products a lot. First up is the Stila Lip Glaze in Guava. This is such an easy gloss to wear and the color is very subtle, yet makes your lips look nice and juicy. I have been obsessed with the packaging and applicator on these lip glosses for some time. I love how you just twist up the product and it dispenses out of a brush so it makes application really easy. The formula isn't super creamy but it isn't overly sticky either. I think it is right in the middle between the two textures. None of the Stila Lip Glazes I have are in full size, and let's be honest, I probably wouldn't be able to finish a whole one up since I have so many. The way to go with these are to find special trio packs or holiday sets. You get to try more colors out this way and save money! The next lip item is a new favorite and it is just so frikken cute! 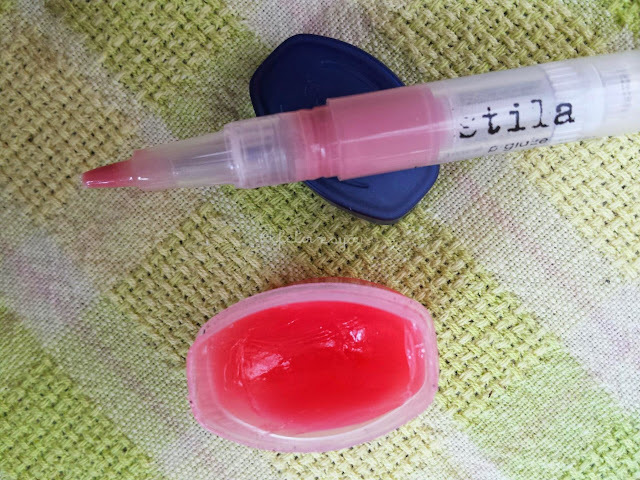 It is this mini Vaseline Lip Therapy in Rosy Lips and I absolutely love it. It is such a travel friendly size and works at just keeping your lips from chapping. It does have a slight pink tint to it which I like and I really do enjoy the slight rose scent to it. It isn't overly strong, but I love all rose scented things so I may be biased, but I have heard other people say they don't smell any rose scent, but for my particular tub of vaseline, there is definitely a rose scent! It's perfect to toss in your handbag or keep by your desk. It's even small enough to fit in your pocket! My next favorite is an old-time fragrance that I have been reaching for more and more last month. 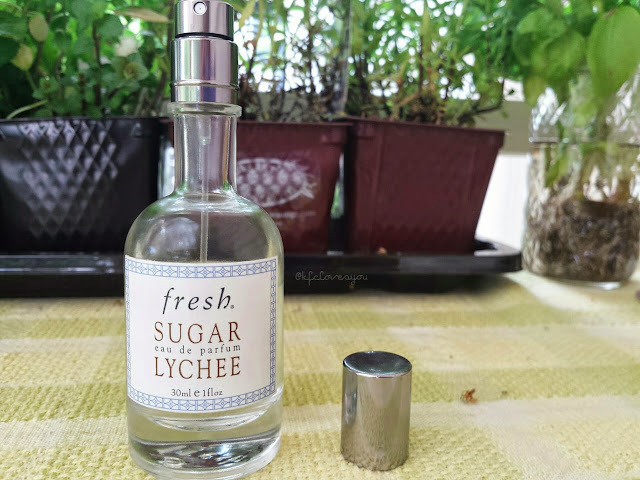 Now to me, this Fresh Sugar Lychee eau de parfum does not really smell like Lychee. I have grown up eating lychee and I know how they smell and taste like, so trust me when I say this perfume doesn't smell like lychee. However, the scent is very sweet smelling and warm and took awhile to grow on me, but I eventually really came to enjoy it. To me, I don't really smell the citrus fruity notes, but I definitely pick up more of the sandalwood and amber notes. Though it is a warmer scent, I do find it to be refreshing at the same time, if that makes sense. If you get a chance to pass by a Fresh counter, I recommend giving this a smell! My last two favorites are lotion/cream type products. One is an oldie but goodie and the other one is a fairly new discovery! 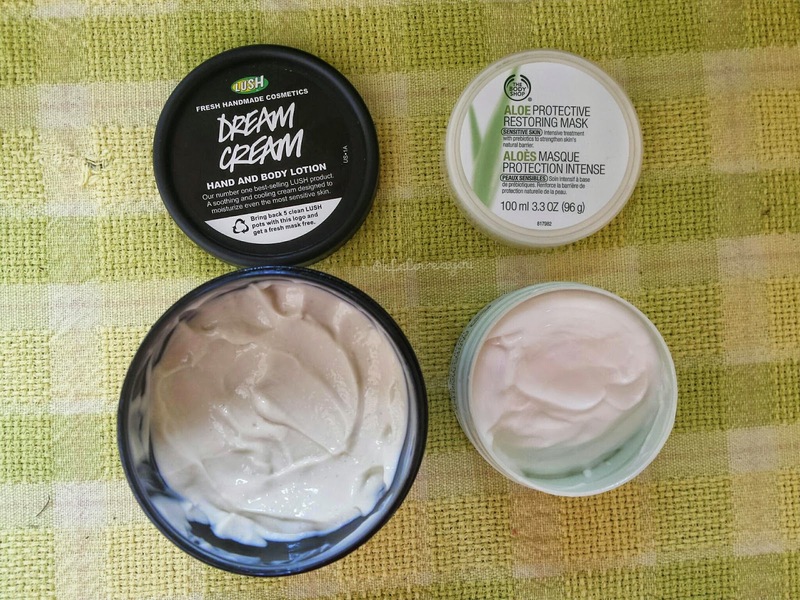 The first one is the LUSH Dream Cream which I have used up before. I recently purchased this new one last month and find myself using this a lot, especially on my body as it gets really irritated during the hot summer days. You can read my full review of it HERE. It feels nice on my skin, the smell is pleasant, and I just really enjoy using it! 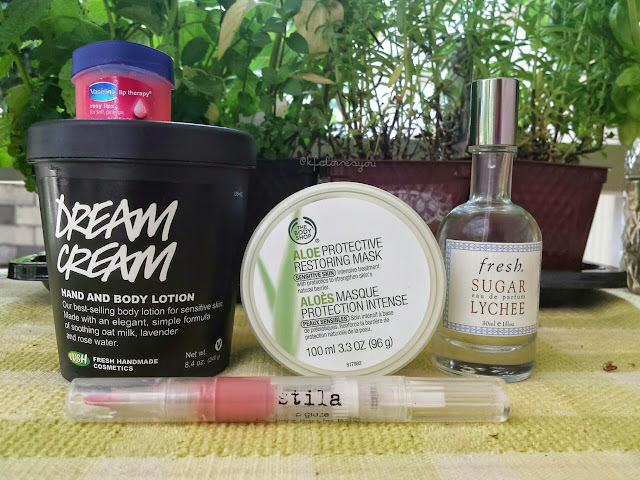 My last favorite is The Body Shop Aloe Protective Restoring Mask . I bought it because I have been looking for something extra hydrating for my skin especially since my skin tends to me on the drier side. It was 40% of The Body Shop's website, so I figured it be a good time to take advantage of the sale since this item originally costs $22.00. I used it about 3 times a week as a night cream and absolutely love how it feels on my skin. I sleep in it overnight and my skin feels so plump and revitalized. Sometimes, I even use this in the morning, but only using a little bit since the littlest bit goes a long way. Hope you enjoyed a look at my July 2014 favorites! What have you been loving this past month? Have you tried any of the products I've mentioned? Let me know! Time is really flying these days. Great post, no I haven't tried any of those. Looks nice! thanks for sharing! oh my goodness, I've fallen in love with Fresh fragrances! I was at sephora a month or so ago sniffing all of their perfumes! Definitely need to go and get one soon! Hope you had an amazing weekend too! Time is definitely zipping past us! I'm so tempted to pick up a couple more scents from Fresh! That Stila lipstick is great eh! ?